At a budget overview hearing on Friday, the N.W.T. government said it's approaching its $1.3 billion debt limit; meanwhile, the Union of Northern Workers president says it can strike as early as mid-November if a new collective agreement is not reached. 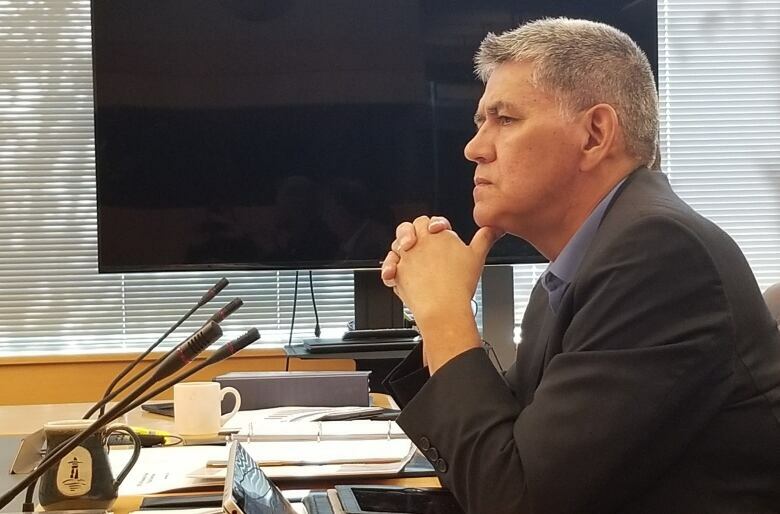 Northwest Territories government employees represented by the Union of Northern Workers could go on strike as early as November, the union's president told CBC News during a public hearing held on Friday about the next territorial budget. The hearing looked at the budget for the 2019-20 fiscal year. It allowed the Department of Finance to gain insight into how each region in the N.W.T. may benefit from the upcoming budget. UNW employees and its president, Todd Parsons, were the only members of the public who attended the hearing. The union represents about 4,000 government of the Northwest Territories employees, who have been without a new collective agreement since 2016. Parsons said ongoing negotiations with the territorial government have not been going well. "I'd like to remain optimistic that through mediation we will be able to find some type of resolve," he said. "That said, there is a very real possibility there will be a labour dispute if we're not able to find that common ground we think the employer needs to concede on." Parsons said the earliest the union could be in a legal position to strike would be in mid-November. Both parties will go back to the bargaining table for three days in October with hopes of coming to an agreement. "I think the UNW has signalled to the media and the public and certainly to our members that we will accept a fair offer," said Parsons, adding that a reasonable ground for negotiations may be a 1.4 to 1.7 per cent salary increase. The union has lobbied the government for a three per cent wage increase over a four-year period. In January, the government responded by proposing a zero per cent increase for 2016, a zero per cent increase in 2017, a one per cent increase in 2018 and a 1.1 per cent increase in 2019. Finance Minister Robert C. McLeod was asked by Kam Lake MLA Kieron Testart on Friday if the department was committed to reaching a deal with the UNW before the 2019 territorial election. McLeod declined to comment on the labour negotiations and referred to the mediation coming up in October. The territorial government is approaching its debt limit of $1.3 billion, deputy finance minister Dave Stewart said at Friday's hearing. Stewart said what is most significant with the amount of debt is the total amount of short-term debt that the government has accumulated over the past decade. To date, the government has approximately $321 million in short-term debt, which has gone toward building schools and roads. Stewart said long-term debt is debt for bigger projects such as the Stanton Renewal Project — the building of a new hospital. Stewart said there are some concerns with short-term debt because it can change with interest. However, he added that it could be worse. "What this assembly has successfully done is stop the bleeding," said Stewart. Stewart added that the government has tried to reduce its short-term debt by not taking on big projects. It has also tried not to rely on money from the federal government, which increases short-term debt, he added.